The American Heart Association (AHA) published a systematic review and meta-analysis of the AGE Reader. Researchers from three countries analysed 10 outcome studies in which the AGE Reader predicted mortality. They conclude that clinicians should consider the AGE measurement when they assess the risk of cardiovascular and al-cause mortality. The publication was authored by independent researchers from Spain, Portugal and Chili. In the meta-analysis they studied 10 published observational studies addressing the association of advanced glycation end products by skin autofluorescence levels measured with the AGE Reader. Higher skin autofluorescence levels were significantly associated with a higher pooled risk estimate for cardiovascular mortality. The original studies were done in diabetes, hemodialysis, non-hemodialysis renal failure and atherosclerosis patients. A high AGE Reader measurement indicated a risk on mortality within 2.5 – 6 years that was 1.5 – 4 times higher. The author, Dr Cavero-Redondo writes that “this systematic review and meta-analysis synthesizes the evidence supporting higher levels of skin autofluorescence indicating advanced glycation end products as a predictor of cardiovascular and all-cause mortality. Diagnoptics was the first company worldwide to introduce a technology to non-invasively measure the tissue accumulation of AGEs by means of fluorescence techniques (AGE Reader). The AGE Reader has been used in clinical practice and research since 2006. Since the introduction of the AGE Reader over 250 peer reviewed scientific papers have been published. Established in 2003, Diagnoptics is the pioneer and inventor of cutting-edge diagnostic devices that can non-invasively diagnose and assess the risk of diabetes and its complications. 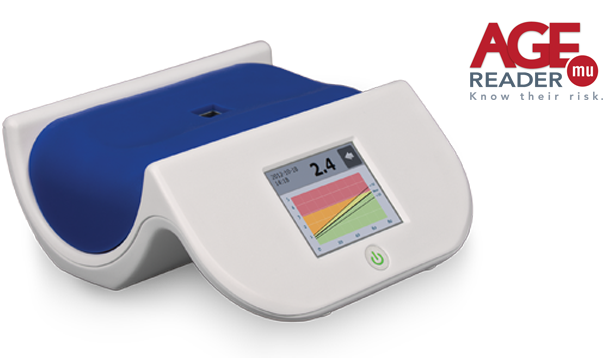 Its technological advance in detecting fluorescence of Advanced Glycation End products (AGEs) has led to the invention of the AGE Reader – a state of art diagnostic device that can non-invasively determine the tissue accumulation of AGEs. Since the CE certification on the first AGE Reader in 2006, Diagnoptics has been marketing this medical device to thousands of clinics around the world. Currently the company is working on obtaining additional regulatory approvals in other regions and is engaged in new product development activities. Diagnoptics is based in Groningen, the Netherlands. The AGE Reader provides an immediate cardiovascular risk prediction for major chronic diseases, such as diabetes, cardiovascular disease and renal failure. The method is convenient, easy to use and validated. The AGE Reader measures tissue accumulation of Advanced Glycation End products (AGEs) by means of fluorescence techniques (skin autofluorescence). AGEs play a key role in the pathogenesis of many age-related diseases, such as diabetes, cardiovascular disease and renal failure.Since the market introduction in 2006, the AGE Reader has been clinical validated extensively in over 250 peer reviewed scientific publications. AGEs are essential biomarkers of metabolic and glycemic stress and have been implicated as causative factors in the progression of a host of age-related diseases, such as atherosclerosis, diabetes, renal failure and Alzheimer. The level of AGEs in tissue reflects the glycometabolic memory and is a valuable predictor of (pre)diabetes and cardiovascular complications.